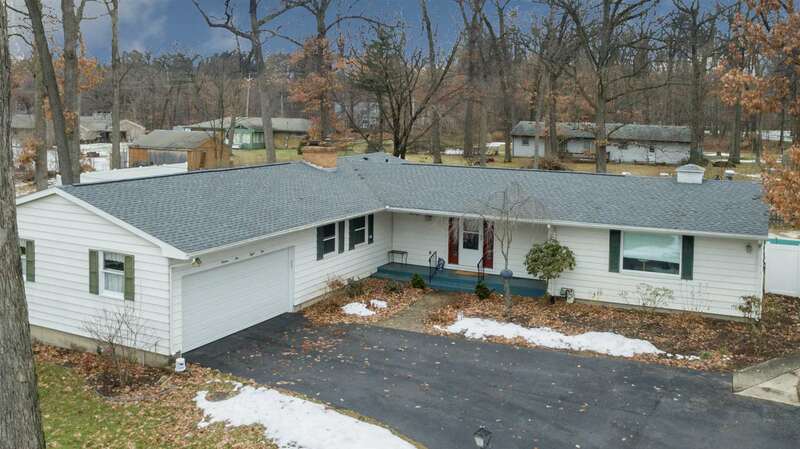 Welcome to this 3-bed, 3.5-bath ranch home in Clay Township. This home is close to everything as it is just off of Grape and Brick. It also has a pool! Less than two years ago this home went through a complete transformation: new roof, new septic, new red oak hardwood floors throughout the main floor, walls were moved to open up the main floor, every wall & every ceiling painted, window treatments added, rehabbed bathrooms, new carpet in the finished basement, new fireplace in basement, all new light fixtures, and a vinyl fence was added to fully enclose the huge backyard. The home has newer windows throughout, main floor laundry, and a master ensuite bathroom. The pool has a new solar cover. The finished basement has a half bath, two rooms, and a cozy feel while also adding nearly 1000 square feet of extra living space. Schedule your showing today!